BILLINGSGATE POST: When Mayor De Blasio ordered City Park Superintendent, Detrick "Dirty Tricks" Detwiler, to replace all of the old fire hydrants along Fifth Avenue and Central Park, he had no idea of the uproar this would cause. 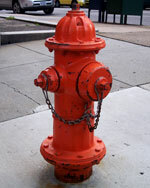 Because he thought dogs should have a moving target to make them more competitive, he thought the new hydrants would be accepted without controversy. However, irate dog owners have been complaining that when their dogs lift their legs to pee, the sensor on the fire hydrant starts the hydrant to revolve at about 6 revolutions a minute. As a result, the dogs lose their balance while pursuing the hydrant with one leg off the ground. In some cases the dogs become dizzy and complain about vertigo as they try to keep up with the hydrant as it makes its rounds. Poodles, especially, become so unstable they collapse and fall into their own urine. As you can imagine, the aristocratic denizens who live along Park Avenue are not used to having their pouty little Poodles suffer this kind of indignation. Some of the older ladies, who have outlived their trophy husbands, are so up in arms their bat wings are catching air and causing them to lift off the ground; a dangerous situation in itself. It is not unusual to witness the spectacle of a dog falling in his own urine while his owner is levitating a few feet off the ground, screaming like a Banshee rag picker for help. With New Yorkers stuck with Mayor De Blasio for another four years, there is little hope that he will rescind his order and replace the revolving hydrants. "I love dogs. But I love my fire hydrants even more."